WAAPA’s acclaimed Music Theatre course provides graduates with the skills and experience required to engage in professional theatre practice. Music Theatre students work closely with WAAPA’s world class teaching staff and specialist tutors who share the knowledge and skills they have gained through professional performance careers. WAAPA's three year, full-time Music Theatre program provides intensive technical training in singing, dancing and acting to develop the professionally acknowledged ‘triple threat’ performer. 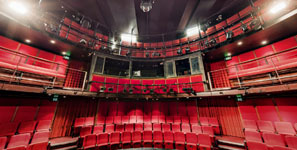 In addition to these core skills, students are instructed in film, television and radio techniques to train them for a wide range of roles in the performing arts. There is also a strong focus on preparing students for professional audition. Practical training is complemented by the study of dramatic literature, the history of music theatre and arts management. Students integrate their class studies with performance training throughout the course in classroom presentations, workshops, chamber music theatre and full-scale musical productions. WAAPA also offers a nationally-recognised one-year qualification in Musical Theatre that reflects the role of performers working or aspiring to work in musical theatre and cabaret productions. Students will develop skills in acting, singing and dancing, and the important integration of all three, through highly practical classes and production projects.